A great deal of functional specialization and cross-over is evidenced in the brief summary in the table on functional morphology and descriptions of the areas of the brain covered in my last post. In fact, the extent to which many areas specialize is understood in minute detail, even to the functional segregation of certain nuclei or bundles of cooperating neurons. The cross-over of many primary activities, such as visual processing, into different areas of the brain and clearly mapped neural pathways is also well-documented. 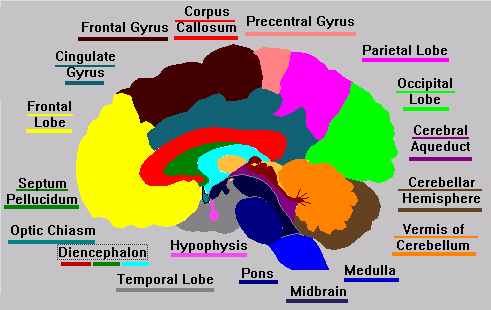 Areas of the cerebrum responsible for motor control of each part of the body are mapped into numbered areas. The motor control of the cerebrum is complemented by the motor coordination of the cerebellum and the involuntary motor control and fine motor-skills centers in the brain stem. Sensory systems feed all three areas. In some of the upcoming posts, I will discuss more of the functions of cognition. I also plan to post ideas on the physiology of electrical transmission between neurons and brain areas that do not touch on the psychological aspects of cognition in their treatment of physiology. These eclectic discussions will all somehow tie in with the general topic of cybernetic research aimed at bridging the knowledge gap by building systems and ontologies that understand context. While it is possible to circumscribe the functions of areas of the nervous system, the intersections are very important (think whole-body cognition). Complex cognitive processes such as interpreting entire pictures or utterances and performing skilled motor actions are poorly understood. Some of the best clues come from pathology. The effects of cranial injuries to different areas of the brain, or the resulting inabilities, have led us to a clearer understanding of the roles played by those areas of the brain. Our understanding of the areas known as the “association pathways” comes from studying certain types of aphasia that resulted from lesions to Wernicke’s area (22) and Broca’s area (44). Receptive aphasia is caused by lesions to Wernicke’s area. It results in reduced or lost ability to read or understand spoken language. Since Wernicke’s area is associated with sensory reception of language, the processes affected are tied to the input. Expressive aphasia, on the other hand, is related to output or language production. Lesions to Broca’s result in reduced ability to speak coherently. There are also other types of aphasia that occur in conjunction or independently of the two most common pathologies mentioned above. 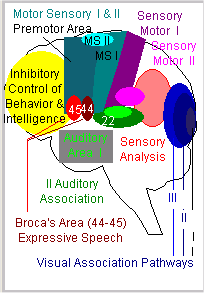 The association pathways affected by these pathologies are shown as speech control (Broca’s) and Speech Processing (Wernicke’s) in the illustration at left. It’s amazing how we learn so much from analyzing both the proper and improper functioning of this most advanced and delicate of instruments. I am not a neuroscientist. My study has been superficial. But I don’t shy away from making observations that could lead me and us to better designs for the systems of the future. I do claim to be a linguist, and I think that, while not the most important aspect of human cognition, I think it is one of the most interesting and instructive in the broad spectrum of brain functions. As we further explore the inner reaches of the apparatus of sentience, I will attempt to show how language expressively represents the context of our day-to-day activities and how these association pathways give us clues for modeling smarter systems. Posted by Joe Roushar in Cognitive Science, Linguistics, Neural Networks, Neuroscience, Science , Followed with No Comments.